Architectural styles of buildings have changed throughout our history from Native dwellings made of wood and skins to skyscrapers made of steel and glass. Uncovering pieces of history hidden in the stories of a building is as exciting as going on a treasure hunt. By investigating the buildings in your neighborhood you may find out something about the time period in which the house was built, the people who built the house, and how people lived in that house. You may discover how materials were used for building, what colors were popular in different time periods, or how people spent their time in different eras. Looking into buildings makes history come alive, and it allows you to look into the past. An awareness of the past allows us to enrich our present and future. So lets take a journey through Mount Vernon and see what we can discover about the building of our historic homes and the lives lived in them. The environment: What weather does the house need to withstand? What materials are available? The purpose: Is the house temporary or permanent? Who is going to use it? The technology: What tools are available for building? What labor is available? By observing the details of a building, you can begin to identify the architectural style that the house most resembles. The style of the house–how it looks–may have been influenced by artistic choices by the builder, the environment, or the time period in history in which it was constructed. Look at your own house and see what you can discover. Did you know that Mount Vernon has a unique collection of brick houses that date from before the Civil War through the 1860s? Do you see a pattern in the brick on the Albright house? Describe it. What do you notice about the roof? How many windows do you see? Where are they located? Where is the chimney located? How would you describe the shape of this house? What are some details of the house you see in this photo? 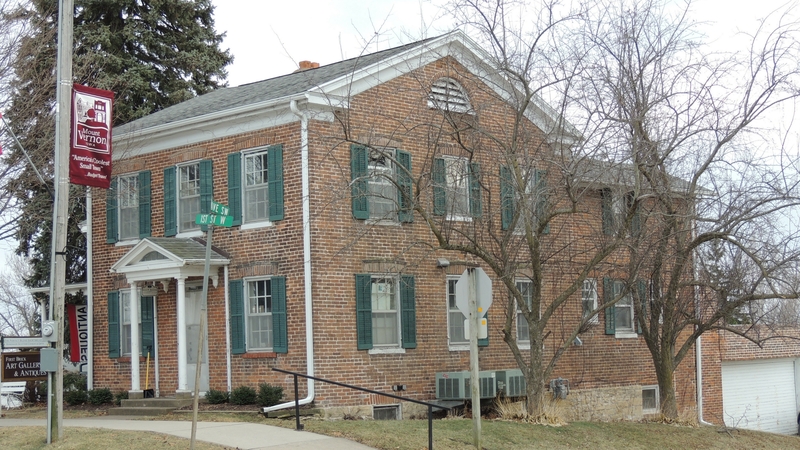 The Albright house is the first documented brick home in Mount Vernon. The Albright brothers, brick makers and builders from Pennsylvania, built it in 1853. The house is an example of a colonial style house with a central chimney, the door centered on the long side with a window on each side of the door, and three windows on the second story. The brick style is called English Garden Wall pattern. It is probable that brick builders brought the patterns, roof shapes, and details for the houses to Mount Vernon from their home states and countries. Imagine you lived in the Albright House in 1853. What do you think your life would have been like? How would living in this house in 1853 be different from living in your house today? What chores might you have done while living in this house? What kind of activities would your family have done? write a story comparing your life today to life in this house as you imagine it. 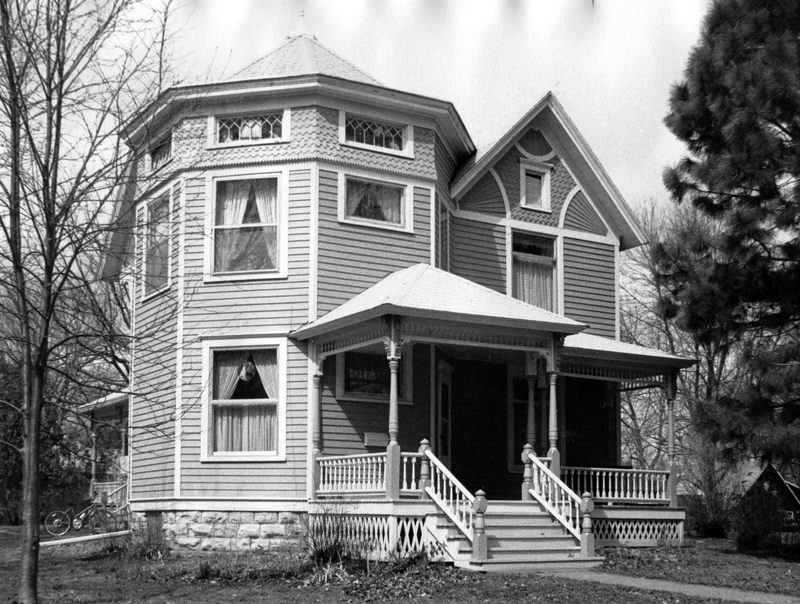 This house was built in 1896 for William B. Van Valkenbery. Steeply pitched gables and wood strips show the influence of the Stick Style. Notice the shingle patterns, a rooftop finial, and siding placed in a fan shape (sunburst) radiating from the three corners of the triangle formed by the gable. The balustrade has turned balusters with carved newels. Lesson: House Styles: What is Style and How Will I Know It? Style is always changing. It changes according to people’s needs and their ideas. Styles come and go, and then they come back again. Architectural style is defined by the Oxford English Dictionary as, “a definite type of architecture distinguished by special characteristics of structure and ornament.” Architectural styles of houses change over time to represent the current fashion. Houses show popular trends over historic time periods that change its shape, materials, and details. Most houses are not pure examples of a particular style. Many houses are a mixture of many styles, while some houses have also been altered over the years, changing their style. In order to identify a style, the focus needs to be the architectural details. Various stylistic periods of home building focus on changing structural details. The details noted in a colonial style home will be quite different from those of an Italianate house. By studying details it may be possible to identify the house’s style. Some styles had periods of revival. This was especially true in the 19th century when people brought back more ancient styles of Greece, Rome, and Europe. Have the students select a style term from a box. Allow students research time to discover the characteristic details that describe the style selected. Have students draw a house of the selected style labeling the characteristic details they have discovered through research. Use white drawing paper and pencil for the initial drawing. Go over the drawing with fine-line black markers and label the details that represent the style. Have students photograph houses in Mt. Vernon that they think illustrate the style they have selected. They may photograph the entire building or just the details that fit a style. Load photos on the class computer and have the student identify the style through the photo. William E. Platner, a hardware dealer and stone quarry operator, built this house in 1913 for his wife who wanted a nice house for her parties. This photo illustrates some of the elaborate details found on Victorian period houses built by people of wealth. The Architecture of Old houses demonstrate their charm through the variety of details that builders crafted at the time the house was built. Each detail is unique, but the combination of related details gives the house its relative “style.” Because houses usually don’t fall neatly into categories, by learning the vocabulary of architectural details you can put the pieces together to determine why a house looks a certain way. The careful attention to details that were added to old houses is a cultural treasure chest of the past. The architectural details are the “clues” that help you observe a house closely to determine not only its style but also its time and place in the history of Mount Vernon. The names of architectural details should be written on slips of paper and placed in a container. You might consider duplicating the most prominent features. Show students the photograph of the elaborate Victorian and explain how the details of the house contribute to the identity of the style. Also point out some of the terminology of the details. Have students pick out 3-5 slips of terms from the box. Allow time for students to research the terms, devise a definition, and draw small illustrations of the details. Create an illustrated class dictionary of architectural terms, electronic or hard copy. Have students create a drawing of a building that incorporates all of their selected/researched details. Present the drawing to the class pointing out the details. Take students on a walk through an historic neighborhood with a “bingo card” or scavenger hunt designed from the researched details. See how many details students can identify and find. Send students out to photograph examples of the architectural details that they find in Mount Vernon. Mr. William Brackett built this house in 1877. He arrived in Mount Vernon from the East Coast with the hope of making money from the railroads that has just crossed the Mississippi River. He lived in the house with his wife and three daughters. When the house was first constructed, it was a much simpler house. In 1912, Clara Brackett, one of the daughters, wanted a house for entertaining, and so the house was remodeled. Porches were added and a Colonial Revival Style was the outcome. Researching the history of an old house is like solving a mystery. Not only will you be working as a detective but also you will be working as a historian. In order to find clues you will need to search through historical sources. Locating these sources will take some detective work. Sources may be found at: the State Historical Society in Iowa City, the Mount Vernon Historical Commission archives, the public library, Cornell College Archives, Linn County offices. You will need to understand the differences between types of sources in order to weigh the authenticity of the evidence you find. Primary sources are materials written, printed, or recorded during the time period under study. People who have already studied primary sources and written down some general ideas write secondary sources. When using a secondary source, it’s a good idea to ask yourself: Who wrote this material? What primary sources did the author use? How long after the event was the material written? Architectural facts–date of construction, name of the builder or architect, materials used, physical changes made over time. 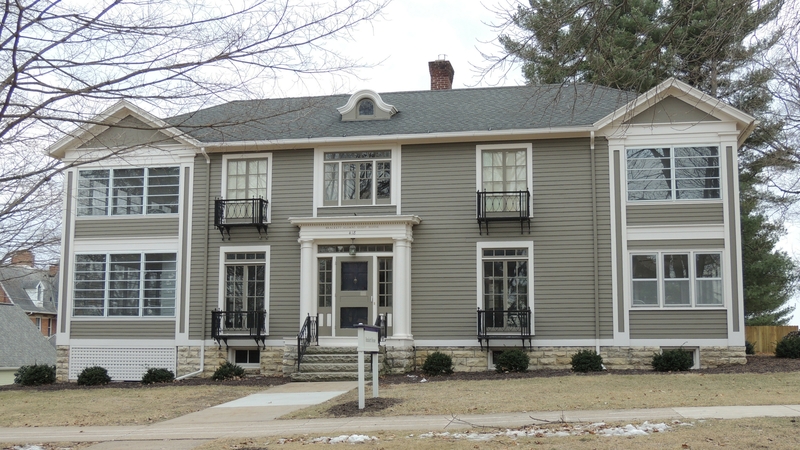 Historical facts–original owner, other residents of the structure, interesting events associated with the building, life styles during the time the house was originally built. 1) Use an architectural field guide to help identify the era in which the house was originally built. Examine features like windows, doors, and the actual layout. Try to identify the house’s main style. 2) Request an interview with the current owner. Ask about an abstract (a legal history of the ownership of the property). Ask about previous owners. They may also be helpful in researching back in time or directing you to other people to interview. 3) Check the records from the Mount Vernon Historical Commission, the public library, Cornell College archives, Linn County Recorder’s Office. See which of these materials you can find: Deed, building permit, tax records, Sanborn Fire Insurance Maps, City Directories, newspapers, family histories, census records. Who designed the home: builder, architect, owner? What features were once standard on earlier homes that have now disappeared? How did people live in the original time period that the house was built? Build a model of the house in its original form. Design a pamphlet giving a self-guided tour of the house including its history and architectural information. Prepare a webpage illustrating photos and text of the house’s history. Give an oral presentation as if you were the builder/architect/ owner of the house. Write a history of the house from the house’s point of view. Barns in the US developed in response to the needs of farmers. Some barns reflected the traditions of the people who built them; some represented regional or local building traditions. Others were built factoring in the availability of local materials, and still others were built with specialized uses in mind. Historic barns were built to patterns developed and popularized by land-grant universities, or sold by Sears, Roebuck and Company and other mail-order firms. And others fit no category at all: these barns attest to the owner’s tastes, wealth, or ideas about agriculture. Barns built in the 17th, 18th and 19th centuries were adapted from ideas for barns found in Europe. By the 1800’s, farmers depended on their barns to store their crops and house their animals. Cozy pens beneath the haymow provided shelter from harsh winter storms and summer heat. Spacious lofts above offered ample storage for crops and feed. The most remarkable thing about an old barn is its framing. When people were ready to build a barn they “raised” it. The favored material for building was timber, which was essentially a squared-off tree trunk. Usually the thick timbers needed for the skeleton of the building were cut down in the process of clearing the land. Units of the frame, called bents, were put together on the ground, then raised and held in position with long pikes, rope and pulleys until they could be joined. All of the members were connected with mortises and tenons and secured not with nails or other hardware but with wooden pins driven through holes bored using an auger. Raising a barn was more than a single man and his family could manage, so helpers would come to the barn raising. Iowa barns were built to house cattle, sheep, hogs, and horses. The animals were on the lower floors. The barn would have corncribs, grain bins; it would store root crops and seeds that were saved from year to year. There would be space for agricultural implements. The barn would have a thrashing space. Hay and flax would be stored in the barn. There were few windows because glass was so expensive, so there was not much light and rather poor ventilation. 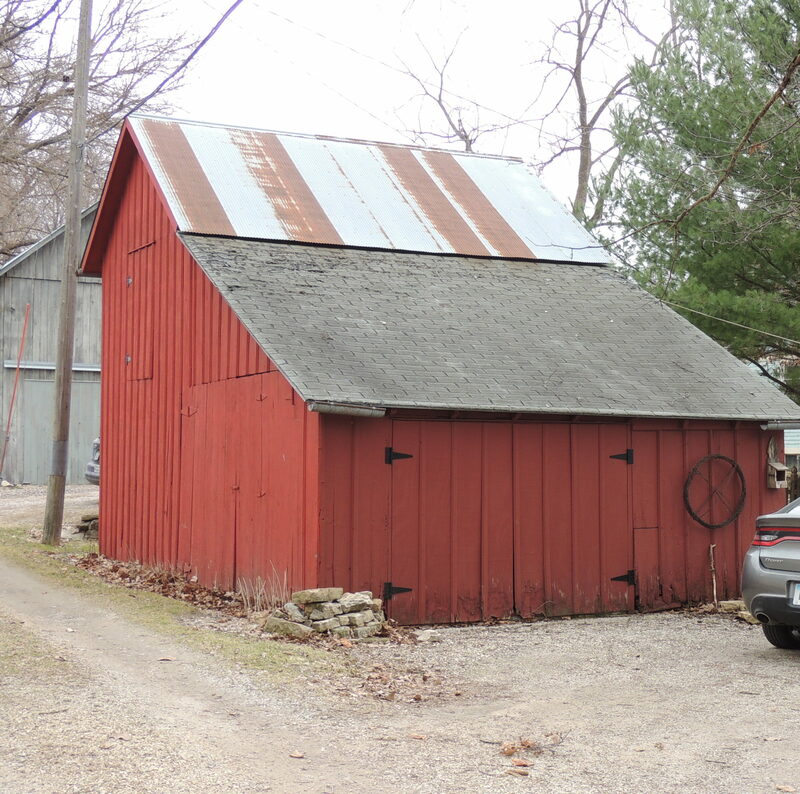 As barns got bigger, the ventilation improved from the ventilating cupolas now built on the roof. The roof had a very steep pitch to it. Occasionally a farmer would make his own shingles from hearts of wood. A hundred years ago slate was used as a roof material. Most of the Iowa barn roofs are gambrel style from a European style influence. The gambrel, sometimes called a hip roof, was developed to create more useable room over a given floor area, and the practice spread quickly among barn builders everywhere. Students can research one of the classic barn styles: Bank barn, Round & Polygonal barns, Tobacco barns, English barns, Dutch barns, Crib barns, Prairie barns, or Stone barns. Create a model of the barn. Draw and label features of the barn. Develop a timeline showing changes in barn construction over time. Write a persuasive essay explaining why one type barn is best for a particular type of farming. Take a field trip to the 1883 Seacrest Octagonal Barn, Downey, IA. Explore the pros and cons of preserving old barns. Have a class debate. Blumenson, John, J.G. Identifying American Architecture: A Pictorial Guide to Styles and Terms, 1600-1945. Nashville, TN: American Association for State and Local History, 1977. Carley, Rachel. Visual Dictionary of American Domestic Architecture. Henry Holt& Co., 1944. Center for Understanding the Built Environment. Walk Around the Block. Prairie Village, KS: CUBE, 1992. Ching, Francis. Visual Dictionary of Architecture. Wiley Books, 1996. Cragoe, Carol. How to Read Buildings: A Crash Course in Architectural Styles. Rizzoli, 2008. Educational Development Center. Designing Spaces. Portsmouth, New Hampshire: Heinemann Press, 1993. Gaughenbaugh, Michael & Camburn, Herbert. Old House, New House, Washington, D.C.: The Preservation Press, 1993. Gebhard, David & Manshiem. Gerald. Buildings of Iowa. Oxford University Press, 1993. Glenn, Patricia Brown. Under Every Roof, Washington, D.C.: The Preservation Press, 1993. Hopkins, Owen. Architectural Styles: A Visual Guide. Lawrence King Publishers, 2014. Keyes, Margaret. 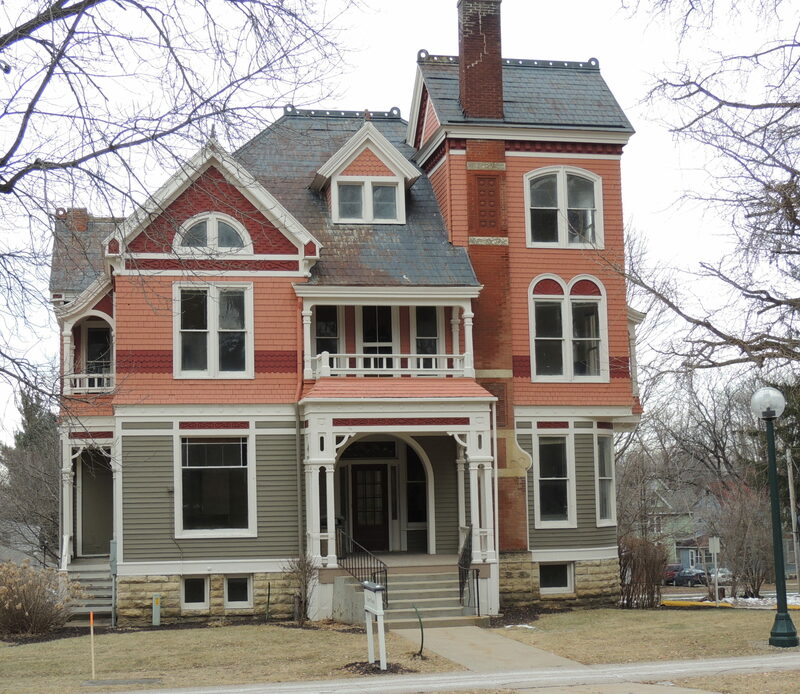 Nineteenth Century Home Architecture of Iowa City. Iowa City IA: University of Iowa Press, 1993. Klein, Marilyn & Fogle, David P. Clues To American Architecture. Washington, D.C. and Philadelphia, PA: Starrhill Press, 1985. Maddex, Diane. Architects Make Zig Zags. The Preservation Press, 1986. Salvadori, Mario. The Art of Construction. Chicago Review Press, 1990. Smith, A.G. Victorian Houses. Dover Publications, 2001. Taylor, Lisa. Housing: Symbol, Structure and Site Cooper- Hewitt Museum, 1990. Tucker, Jean S. Come Look with Me: Discovering Photographs with Children, VA: Thomasson-Grant, 1994. Von Tscharner, Renata & Fleming, Ronald Lee. A Changing American City Scape. Dale Seymour Publications, 1993. Wilson, Forrest. What it Feels Like to be a Building. National Trust for Historic Preservation, 1988. Winters, Nathan B. Architecture is Elementary: Visual Thinking Through Architectural Concepts. Salt Lake City, Utah: Peregrine Smith Books, 1986. Young, Katherine A. Constructing Buildings, Bridges and Minds, Portsmouth, NH: Heinemann, 1993.